The foie gras It is one of the quintessential gourmet products. Its soft texture and aroma are unmistakeable and a delight for any palate; and when combined with other products then the experience is much more delicious. So foie lovers in all its variants are lucky, because our shop in Barcelona just arrived two new truly irresistible flavors: Jijona nougat and Truffle. It is one of the most classic and traditional combinations exist, very characteristic at the tables Christmas, but so exquisite that deserves to be enjoyed throughout the year. This is an exceptional combination between Jijona nougat cream and foie gras. Soft and delicate flavor of foie combines perfectly with sweet flavors created by the contrast between the two. There are many ways to play this exquisite marriage as long as the nature of foie be respected to avoid tarnishing its flavor. 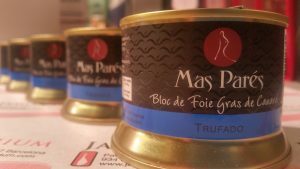 Mas Parés, our suppliers of these delights of foie, Always treat it with the utmost care and respect in order to ensure highest quality in all combinations. In this case we find nougat Jijona in the center of foie. The texture of caramelized almond nougat blends perfectly giving us an incredible tasting experience that will conquer even the most discerning palates. There is no better way to do perfuming a dish with truffles, so with foie would not be less. Thus, the truffle is one of the most faithful companions of foie (both duck and goose of). The combination of the two flavors is round and provides great pleasure aromatized. A foie gras paired with truffle must contain at least one 3% truffle. Our duck foie contains a 3% melanosporum truffle. It comes time to try these new delight foie either the starter or starter. We will remove it from the refrigerator about 10 minutes before eating to take the temperature. Recommend taste the foie accompanied by a good slice of toast, slightly crunchy. This can be a normal baguette, rustic or style Poilâne, a classic in terms of foie tasting is. We can also choose to melt the foie gras on a slice of bread with nuts. The combination is amazing! And if it is roasted then it is an otherworldly experience since being a little hot, Foie will extend better, and we can fully enjoy its aroma and softness. If we want to make the experience all round accompany the tasting with wine or champagne, as the foie harmonizes perfectly with both. For the choice of wine should avoid those that are too young, light or acids. They are preferred those complex wines, bodied and able to be Crianza, such as Hacienda Monasterio (D.O. Ribera del Duero). We can also opt for one that presents a fruity touch, as the Chopped de l'ala (D.O. Empordà). 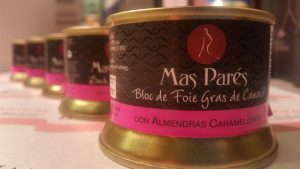 If you want to delve to the delicious world of foie and their combinations our physical store in Barcelona and in the online store you will find many possibilities and innovative flavors, all delicious. Combine the foie is not very difficult because it is a product that accepts almost any type of passenger, simply they should avoid too strong or bitter flavors to enjoy it in its fullness.